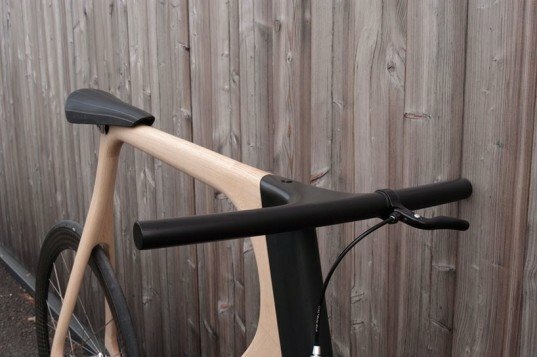 Would you buy this wooden bicycle for $11,000? What’s the most you’d splurge on a new ride? For some, dropping 11 grand is a fair trade for one of the most unique bicycles ever made: the Arvak Bicycle. 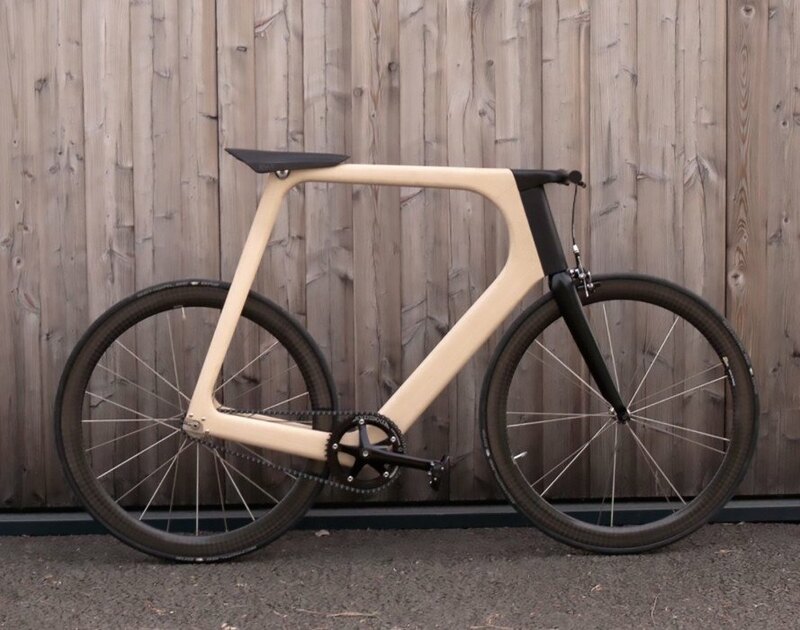 Named after the Norse mythological horse that pulls the sun across the sky, the minimal and lightweight Arvak is a spectacular machine handcrafted by Keim, a French studio that claims the wooden bicycle is a superior (and quieter) ride than carbon fiber. The bicycle’s most eye-catching feature is its custom-built monocoque frame made from a composite of white ash wood layers. Designer Paule Guerin and woodworker Till Breitfuss founded the Keim studio and chose to work with wood for its potential as a sustainable and durable building material. The duo unveiled the Arvak as their first bicycle creation in April 2014, but the bicycle recently caught the eye of bicycle enthusiasts again after it made an appearance at Bespoked 2015, the UK handmade bicycle show. Each Arvak is custom made in Breitfuss’ atelier in France. The contemporary bicycle is made entirely from ash, weighing only 7.5 kilograms in large part due to the hollow monocoque frame made from 24 layers of white ash, vacuum-laminated with a bio-sourced resin. “The orientation of the wood grain is optimized to take advantage of the outstanding mechanical properties,” writes Keim. The handsome frame is complemented with accessories such as high-quality carbon wheels made by Corima in France, Miche pedals, and an Italian-made fi’zi:k seat, all of which are painted black for a striking contrast with the white ash frame. The Arvak was a limited production bicycle retailing for approximately $11,000 USD in 2014. However, prospective buyers can contact Keim on their website for a quote and custom build. The creative duo has since developed a few more sculptural wooden bicycles, including the mythical-looking ALÉRION bicycle and the HONZA, the prototype of which was recently displayed at Paris Design Week last month. Designer Paule Guerin and woodworker Till Breitfuss founded the Keim studio and chose to work with wood for its potential as a sustainable and durable building material. The duo unveiled the Arvak as their first bicycle creation in April 2014, but the bicycle recently caught the eye of bicycle enthusiasts again after it made an appearance at Bespoked 2015, the UK handmade bicycle show. Each Arvak is custom made in Breitfuss’ atelier in France. The contemporary bicycle is made entirely from ash, weighing only 7.5 kilograms in large part due to the hollow monocoque frame made from 24 layers of white ash, vacuum-laminated with a bio-sourced resin. “The orientation of the wood grain is optimized to take advantage of the outstanding mechanical properties,” writes Keim. The handsome frame is complemented with accessories such as high-quality carbon wheels made by Corima in France, Miche pedals, and an Italian-made fi’zi:k seat. All the accessories are painted black for a striking contrast with the white ash frame. The Arvak was a limited production bicycle retailing for approximately $11,000 USD in 2014. Rider taking a selfie on the Arvak. The HONZA prototype was recently displayed at Paris Design Week last month.